There was no historical reference to them before what the Assyrian wrote about the in 850 BC as a troublesome people with no civilization and of course they meant the Medians whom managed under the rule of Deocies (728 – 675 BC) to unite all the Median tribes and establish the Median kingdom, but that did not help a lot with the Assyrians nearby as they attacked Media several times between 681 and 669 BC in a way that helped the Median king to unite all the tribes and created hate between the two which lead to the fall of Assyria as we pointed out in the History of Assyria article in the life explained history blog. 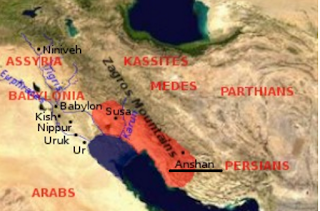 The Assyrian attacks continued under Ashurbanipal (669-627 BC) and managed to kill the second king of Median Phraortes whose son Cyaxeres seceded him and was only 20 years of age. 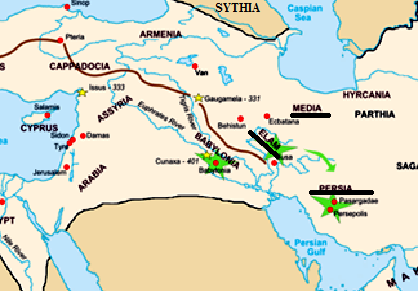 The Scythians to the north invaded Media and the new king was overwhelmed as it took him another 20 years to manage removing them from the land , in that period the Babylonians lead by Nabopalassar revolted against Assyria in 625 BC, and the Assyrians were getting weaker by the time while the king of Media was rebuilding the state and the army. 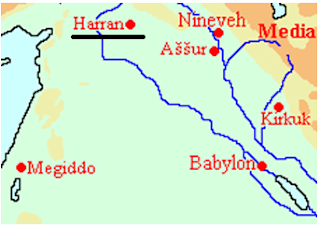 In 614 the Medians and the Babylonians joined force and succeeded in defeating the Assyrians and conquering its old capital Ashur and completed conquering all Assyria by 612 BC after the fall of Nineveh, they divided the Assyrian empire among themselves and to make the treaty more sound the Babylonian crown prince marries the Princess of Media. The Median king went on to Anatolia and conquered it which made Media an empire but his dreams were cut short as Cyaxeres died in 585BC and his son Astyages ruled but was nothing like his father and was very hated by the people of Media. 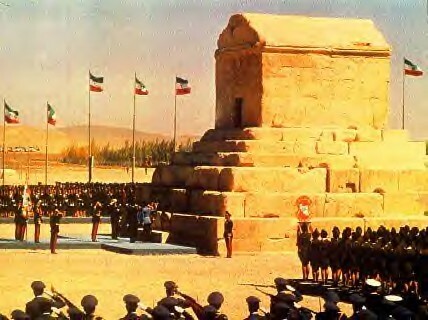 Until one day when Astyages saw a dream that his daughter will give birth to a great king that will rule the world, so he decided to make her marry a Persian prince as he did not think much of the Persians called Cambyses and in 583 BC Cyrus was born and as he grew up into a clever young Prince, his father made him rule an area south called Anshan (not far from the city of Shiraz Iran today) in the year 559BC. 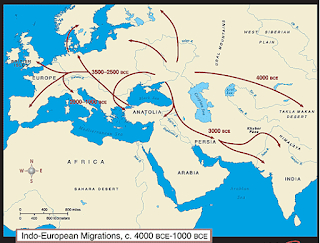 So his father was ruling Persia and his grandfather was ruling the Median Empire. In 556 BC the last Babylonian king Nabonidus, whom was obsessed by the city of Harran because his mother was a priestess for the moon god sin. 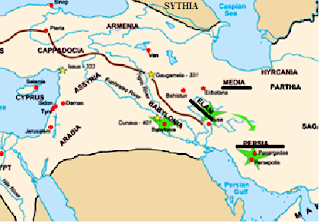 But Harran was under Median rule, so Nabonidus makes a deal with Cyrus that he will help him defeat his grandfather Astyages of Media if in return he can have Harran, the idea seemed good to Cyrus and both Persia and Babylonia made a coalition and in 550 BC Media fell rather easily to Cyrus since the Median army defected to him, so Cyrus became the first emperor over the Iranian plateau to what was called the Medo-Persian Empire. 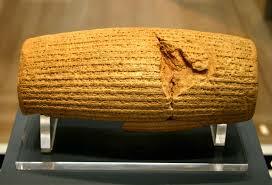 Cyrus the great ruled: 559-530 BC and instead of writing I will put a map to show the size of the Persian Empire during his rule and the years of conquests. In line 36 (45 lines all together) he wrote: "The people of Babylon blessed my kingship, and I settled all the lands in peaceful abodes." 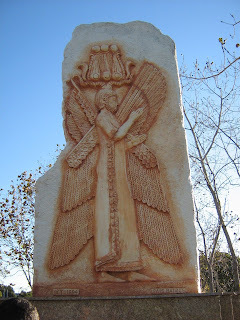 In line 33 he wrote "at the command of Marduk, the great lord, I settled in their habitations, in pleasing abodes, the gods of Sumer and Akkad, whom Nabonidus, to the anger of the lord of the gods, had brought into Babylon." The tale that he saw a vision that the Babylonians are committing sins and it is time for their conquest and clean the society. He was mentioned in both the Bible Isa. 44, 45 Ezr.1 and in the Quran 18-84 and is called "thu alqarnain" meaning the man with 2 horns. 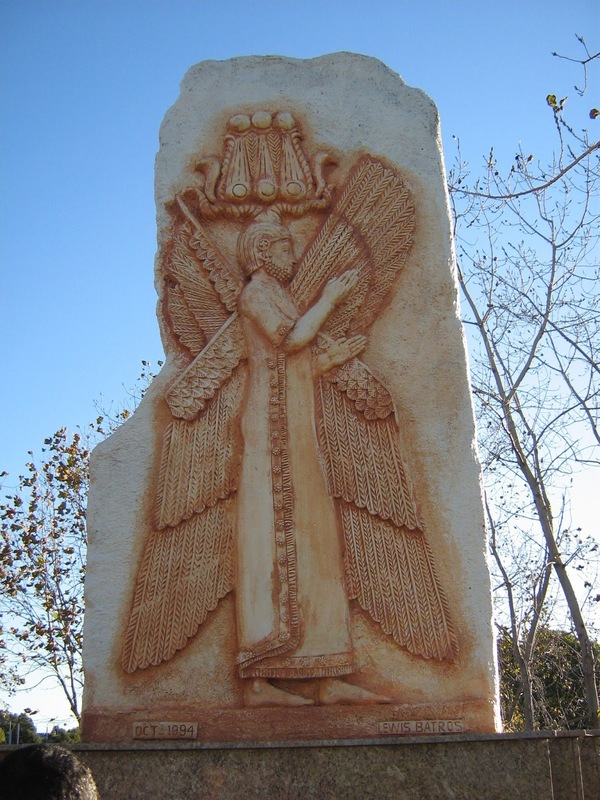 Also unlike other emperors there is only one statue found for him and has a great meaning wearing an Elamite robe, An Assyrian wings and an Egyptian crown in a symbolic notion that he is not the Emperor of Persia only so Assyria symbolizes all Mesopotamia, Egypt symbolizes Africa and Elam the Iranian Plateau . 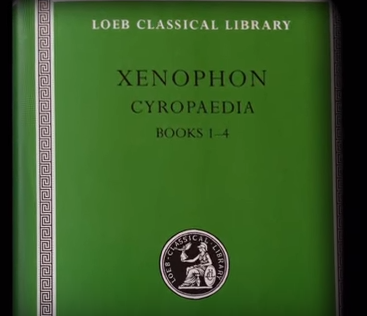 The famous Greek historian Xenophon wrote 4 books about how to run a country and rule an empire, since he was a great enthusiast of Cyrus rule he wrote Cyropaedia, and according to the British museum that Thomas Jefferson had 3 copies of this book and used to refer to it regularly. In my opinion Cyrus was one of the greatest emperors in history, whom showed us a model of tolerance that can lead to greatness and to me he is a man of GOD since he was called a Messiah in the Bible and is the only Messiah that is not a Jew and if we know that the word means anointed one I cannot see a pagan be one plus in the Quran he was mentioned " we established his power on earth and we gave him the ways and the means to all ends". When he released the captive Jews in Babylon they showed him his name mentioned in Isaiah's prophecy according to the Jewish historian Josephus, he gave them all the support to build the second temple, and that is another proof that he was not a pagan in my opinion.